The preference and selection of cigars is something that most new cigar smokers would have trouble choosing. A lot would rely on word of mouth recommendations while some would pick the first one they see on the shelf, relying on presentation and price effectiveness as their main points for decision-making on what cigar to buy. 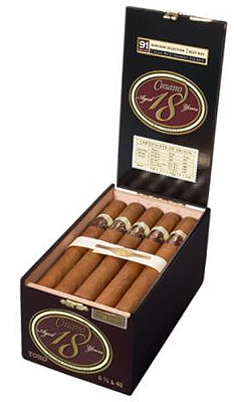 Cusano 18 holds a prestigious honor of providing the cigar aficionados something to look forward to. With its rich, creamy and packed flavor, the Cusano 18 is sure to give great value for the cigar smokers that cater towards complex and appealing scent rolled premium prepared tobaccos that all cigar lovers are looking for. Originating from the Dominican Republic as developed and offered by Mike Chiusano. With the expertly rolled tobaccos, each cigar provides the quality cigar that everyone is looking for at the affordable prices that people are actually looking for today. With its variant blends and flavors, cigar fanatics are sure to want to try this out once given the chance and spotted at their nearest cigar shop.